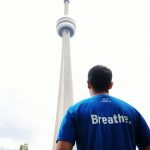 To celebrate the first day of Respiratory Therapy Week, and in the spirit of strengthening the community of RT’s, we will join together to run/walk the Scotiabank Waterfront 5k to raise money to support Respiratory Therapists Without Borders (RTWB). To Participate in the 5k walk or run event. Regardless of your walking/running speed, lets choose the following detail so we can all start at the same time. 3. If you choose to raise and donate money to RTWB select No for Do you want to participate in the Scotiabank Charity Challenge as a fundraiser or make a donation?